LAHORE: In order to give impetus to Pakistan’s halal industry, the Punjab Halal Development Agency (PHDA) and the Punjab Enabling Environment Project (PEEP) have signed a memorandum of understanding, under which both will work together to give a push to the sector and help it reach the real potential. “The MoU will help promote new investments in the halal meat industry and open doors for new business opportunities leading to a broad-based economic growth,” said US Agency for International Development (USAID) Director for Punjab Dr Miles Toder while speaking at the 4th International Halal Conference here on Tuesday. “The conference and exhibition provide a platform to develop business linkages and will give participants an opportunity to talk about the international trade and investment potential of Pakistan’s halal industry,” he added. USAID-funded PEEP is a five-year programme worth $15 million, which will improve business environment by promoting policy and regulatory reforms through private sector-led advocacy. These reforms, if implemented, are expected to spur investment in dairy, livestock and horticulture sub-sectors, leading to fast-paced employment generation. Through this project, USAID is also helping to increase the institutional capacity of public and private sector organisations in an effort to support and sustain policy reforms at provincial and federal levels. Published in The Express Tribune, March 11th, 2015. LAHORE: The lifting of 10-year-old ban has brightened prospects for exporting poultry products to the Middle East countries. 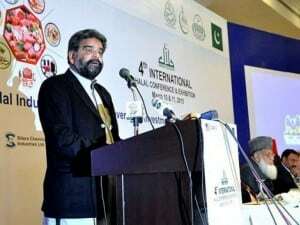 “It is a good omen for the local poultry farmers,” said Federal Minister for National Food Security and Research Sikandar Hayat Bosan while speaking to newsmen after inaugurating the 4th International Halal Conference and Exhibition on Tuesday. He said a regulatory authority would soon be set up with consent of the Council of Common Interest, which authority would issue certificate for halal products. Pakistan Poultry Association former chairman Abdul Basit told Dawn that the ME countries imposed ban on poultry products after bird flu epidemic in 2004. “Now the ban has been lifted by some countries and Saudi Arabia is importing hatching eggs from Pakistan,” he added. Meanwhile, representatives from the international and local halal food/meat industry, public and private sector stakeholders and academia discuss trade and investment potential of the halal industry. Punjab Halal Development Agency (PHDA) and USAID-funded Punjab Enabling Environment Project (PEEP) collaborated in hosting the conference. A memorandum of understanding between the PEEP and the PHDA was also signed on the occasion. “The MoU will help promote new investments in halal meat industry and create business opportunities leading to broad-based economic growth,” said USAID Director for Punjab Dr Miles Toder. Out of estimated $3 trillion share of global halal food industry, Pakistan’s chunk is just $115m. ISLAMABAD: Minister for Finance Ishaq Dar and the US secretary of commerce urged the US investors to take optimum benefits from the lucrative and investment friendly policies of the government and explore investment opportunities available in different sectors of Pakistani economy to further enhance bilateral trade. The speakers among others highlighted the investment friendly environment and policies in Pakistan. Mr Dar said that government would provide every possible facility to US investors to invest in Pakistan adding that one-window facilitation center has also been established to facilitate the foreign investors. Minister for Commerce, Engineer Khurram Dastgir Khan said that Pakistan is leading several strategic initiatives to build trade, energy and communications corridors linking South Asia, West Asia, Central Asia and China. Regional integration will accelerate economic growth and prosperity in this part of Asia, and beyond.